Norman created a new card game, calling it the Food Monster one. It basically has eight cards. He named them Chili Flame, Ice Golem, Biscuit Monster, Carrot Twister etc. Each card has a set of "weapons" and points. It is played by two people. It could also be played by three or four if Norman, the creator, is to draw more pictures. Norman drew these pictures with the Window Paint program at his computer. I helped to print these cards in my color printer this Thusday afternoon after school. We used very sharp cutter to cut the cards and later laminated the cards in a photocopy shop near our house. Each card has a name. Each card has a certain point. Unidentified Flying Pies has the higgest score of 200. 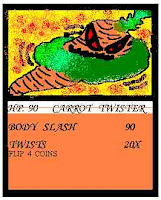 "I spend one night to draw a card," he said, adding that his idea to draw these cards originate from the Pokemon card with its own characters. The game is to begin with the players throwing respectively a card. They will do the scissor-paper-stone to decide who will attack first. This is the most crucial part of the game. If you could always attack, which is nearly impossible, you could deduct the numer of point's of your opponent's card. When your opponent's score is drained, he should draw another card. The one who loses the cards first is the lose. Norman said he would like to show the cards to Badar Khan, his classmate at Gandhi Memorial International School. 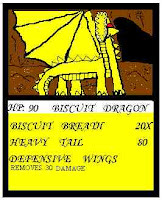 Both Badar and Norman have passions for this card gaming. I enjoyed playing the cards with Norman. He also told me the ideas behind each picture. He used carrots, pies, ice cream, chocolate, biscuits and other food to inspire his drawings. The black Scream card was inspired by the characters of Dementors in Harry Potter's series. Norman collects the American edition of the series. They have pictures drawn by Mary GrandPre. Norman obviously admires the illustrations in the series. He also read of J.K. Rowling's books.